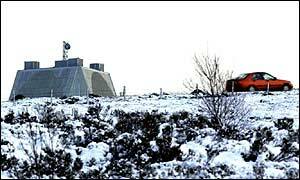 The UK looks set to offer British radar facilities for a new US missile defence system (NMDS) dubbed 'Son of Star Wars'. Defence Secretary Geoff Hoon told MPs his "preliminary conclusion" was that the UK should agree to America's request to upgrade the Fylingdales radar station in North Yorkshire. Mr Hoon said involvement in the project would not prejudice British interests. Nor would upgrading the radar station mean committing wholesale to missile defence. But a threat of a ballistic missile attack by rogue states could materialise, Mr Hoon warned the Commons. He said the missile system could represent "an invaluable extra insurance against the development of a still uncertain but potentially catastrophic threat to the citizens of this country". Opponents say the scheme is unnecessary, would not work and would simply make the UK a target - without giving it a protective screen of missiles. Former Labour Defence Minister Peter Kilfoyle attacked what he termed Mr Hoon's "slavish devotion to American policy in this area", which he said only added further to global destabilisation. Mr Kilfoyle spoke of "the government's gathering rush to embrace every crackpot notion foisted upon us by the idealogues in Washington". He asked: "I'd like the secretary of state to point out where the independence of thought and independence of policy is from the British government reflecting true British needs?" Fellow Labour MP Alice Mahon told Mr Hoon that government policy was out of kilter with the opinion of the vast majority of people who elected Labour. Mr Hoon faced further question on NMDS when he later appeared before the Commons defence select committee. He has said in the past that the UK would only agree to help the US with missile defence if it was in the UK's best interests. Fylingdales has an advanced radar which could track missiles launched by rogue states or terrorists in, for example, the Middle East. They would then in theory be shot down as they neared the US coast. Labour MP Malcolm Savidge has demanded a Commons debate on UK involvement in the project. On Wednesday Mr Savidge described the system as an "extremely expensive and technically dubious defence against a very improbable form of attack". "It is very closely tied in with the increasingly belligerent approach by hawks within the Bush administration," Mr Savidge told BBC Radio 4's Today programme. "That does not mean we should be ready to basically surrender British foreign policy to the present Bush administration." Last month, the government published a report arguing that taking part in the US plans would not immediately put the UK itself at greater risk of attack. Mr Hoon has previously told MPs the UK would consider "very seriously" any US request to use Fylingdales for a missile defence project. And in November the US head of the missile defence Lieutenant General Ronald Kadish, visited the site on a "familiarisation" trip. Conservative shadow defence secretary Bernard Jenkin said: "This statement is long overdue. Britain should be leading on this issue. "Other European allies are now ahead of us and it is the British defence industries that have been losing out." Mr Jenkin complained that much of the content of Mr Hoon's statement had already been leaked to the press. Liberal Democrat foreign affairs spokesman Menzies Campbell instead accused ministers of undermining their own consultation process through a pre-emptive strike. Mr Campbell said: "What's the rush? It's barely a month since the government produced a consultation document on missile defence, which among other important issues raised the question of US use of Fylingdales." "This will ultimately enhance the security of the United Kingdom"
"There was anger in the commons at the way this was announced"
"The British interest here is to stay in the game at a very early stage"